These terms referring to time of day are set lowercase, with periods and without spaces. Acronyms that appear as main entries in the dictionary can generally be used without first spelling them out (e.g., HTML, IQ, NASA). Other acronyms that are used more than once in a given piece of writing — such as a web or magazine article, a brochure, a letter, etc. — should be spelled out the first time they are used, with the acronym given in parentheses immediately afterward (a departure from AP style). Use the acronym on second and subsequent references. The National Science Foundation (NSF) has released its final report. In it, the NSF makes several timely recommendations. The NSF has released its final report. In it, the NSF makes several timely recommendations. The National Science Foundation has released its final report, which makes several timely recommendations. The NSF has released its final report, which makes several timely recommendations. Avoid overuse of acronyms. When acronyms appear too often in a piece of writing, the resulting "alphabet soup" can impede comprehension and make the prose awkward. Also, when an acronym only means something to those within a specific organization, it should be used sparingly (if at all) when communicating with the outside world. In such instances, use a generic noun or nouns to replace the acronym. The Grand Rapids United Elections League (GRUEL) has announced their support for a slate of candidates. GRUEL members say they hope to change the city come November. The Grand Rapids United Elections League has announced their support for a slate of candidates. League members say they hope to change the city come November. Dr. Mackay has received funding to study the genetics of glaucoma. Doctor Mackay has received funding to study the genetics of glaucoma. Randy Woodson, Ph.D., is the chancellor of NC State University. Randy Woodson, Ph.D. is the chancellor of NC State University. Randy Woodson Ph.D., is the chancellor of NC State University. Randy Woodson Ph.D. is the chancellor of NC State University. Business students who get MBAs face better job prospects than those who don't. Business students who get MBA's face better job prospects than those who don't. AP no longer hyphenates this term or any similar term designating dual heritage (e.g., Mexican American, Italian American, etc.). This program, part of the College of Agriculture and Life Sciences, provides technical training in agriculture and related fields. Students who complete the institute's two-year course of study receive the associate of applied science degree. Do not capitalize or italicize. An alumnus is a person of male, unknown or unspecified gender who has attended a particular school, college or university. Alumni is the plural form, referring both to males as a group and to people of all genders as a group. An alumna is a female alumnus; alumnae is the plural form, referring only to females as a group. Treat capitalization of this department as you would any other department: Capitalize headline style when the full, official name is used, and lowercase otherwise. Debbie Yow is director of the Department of Athletics. Debbie Yow is director of the Athletics Department. In specific references to the department or its staff, avoid the singular version of the word. NC State is hiring an assistant athletics director. NC State is hiring an assistant athletic director. NC State has a variety of athletics facilities located on and off campus. Each has a designated facility name. Carter-Finley Stadium — Opened in 1966 as Carter Stadium in honor of brothers Nick and Harry Carter, textile executives from Greensboro, N.C., who spearheaded the fundraising for the stadium. In honor of philanthropist A.E. Finley, a longtime NC State benefactor, the named was changed prior to the 1979 season. Dail Basketball Center — The home of the Wolfpack men's basketball program. Doak Field at Dail Park — The home of NC State baseball. Doak Field was originally named for longtime coach Charles "Chick" Doak. The Curtis and Jacqueline Dail Softball Stadium — The home of NC State's newest varsity sport. Dail Soccer Field — Home to both the men's and women's soccer team, the field is located in the infield of Paul H. Derr Track. Paul H. Derr Track — A cinder track has been at this location since approximately 1939. It was named for former track coach and head of the NC State physical education department Paul H. Derr in 1979. The J.W. Isenhour Tennis Center — This tennis complex, home to the men's and women's varsity programs, houses both the Andy Andrews Indoor Facility and the Curtis and Jacqueline Dail Outdoor Tennis Stadium. Lonnie Poole Golf Course — Located on 200 acres in the southeast corner of Centennial Campus, the 18-hole championship course was designed by golf champion Arnold Palmer with input from NC State graduates Erik Larsen and Brandon Johnson, both architects with Palmer Golf Course Design. Wendell H. Murphy Center — This facility houses football coaches' offices, locker rooms, training facilities, a weight room, and a lobby filled with displays about the history of NC State football. PNC Arena — This indoor athletics stadium near campus, formerly known as the Entertainment and Sports Arena and the RBC Center, is the home-game venue for NC State's men's basketball team. William Neal Reynolds Coliseum — The home of NC State men's basketball from 1949 to 1999, it remains a multiuse facility for campus events and is the home of NC State women's basketball, volleyball, gymnastics and wrestling. C. Richard Vaughn Towers — This four-level structure at Carter-Finley Stadium includes press seating, a chancellor's suite and luxury boxes that are available for rent. Weisiger-Brown Athletic Facility — This is the home of the athletics department administrative offices. Willis R. Casey Aquatic Center — The pool facility, located in the Carmichael Gym complex, is named for the former swimming coach and longtime athletics director. NC State is one of seven charter member universities of this NCAA Division I athletic conference. ACC is acceptable on second reference. This structure, officially named the Memorial Tower, is colloquially called the Belltower or sometimes the Memorial Belltower. 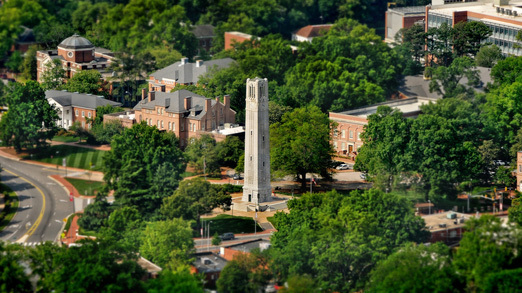 It honors NC State alumni who were killed during World War I. The cornerstone was laid in 1921. The Depression and World War II delayed construction, but the completed tower was formally dedicated in 1949. This is the policymaking body legally charged with governing the University of North Carolina system, of which NC State is a constituent institution. Use the full, capitalized title on first reference: University of North Carolina Board of Governors. Thereafter, use board of governors. This body advises NC State's chancellor concerning the management and development of the university. Use the full, capitalized title on first reference: North Carolina State University Board of Trustees. Thereafter, use board of trustees. This body assists NC State's chancellor and the board of trustees in advancing and promoting the university. Use the full, capitalized title on first reference: North Carolina State University Board of Visitors. Thereafter, use the board of visitors. Capitalize the B when referring to the brick courtyard area that is formally known as University Plaza.